Today's project was revamping my banana nut bread loaf. I felt that it could use just a little more of a realistic touch but I wanted it to also have a bit of "Everything Dawn" incorporated so that it wasn't just a loaf candle. I wanted my candle loaf to look as delicious as it smells, and boy does it smell delicious! My first thought was to envision what I saw when it first hit my nose so I closed my eyes and I visualized a loaf that actually looks like a loaf. Then I imagined all of the walnuts and bits of banana with yummy vanilla cake and cinnamon. By the time I'd done that, I came up with a loaf that I absolutely love! You can see from the pic where the loaf is revealed just in the center and is surrounded by the detailed walnuts and bits of banana. Again, since it's a candle, I wanted to capture all of the deliciousness that you'd taste inside a loaf of real banana bread. My children wanted to have a bite so I must have done what I'd set out to do. 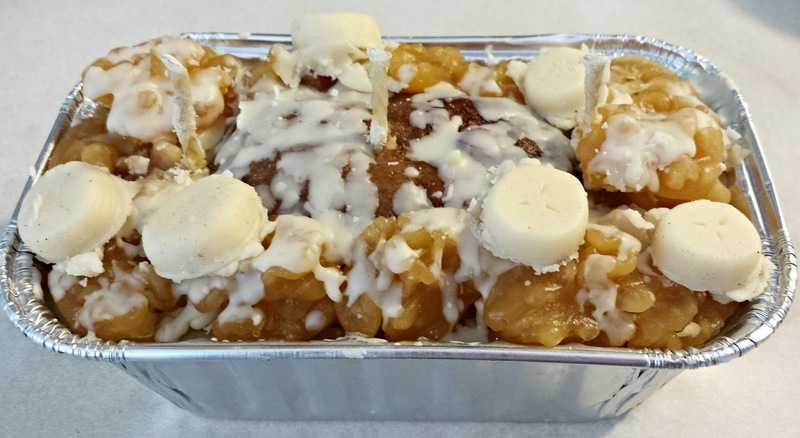 This is about a pound of delicious banana bread candle right here that I'm going to put up in the shop. I'm hoping that all of my customers love this one as much as I do. There's only one way to find out...so off to putting this sweet creation in my shop.